More than 100 police officers were deployed to break up a mass brawl reportedly organised by two rival YouTube stars in Berlin. 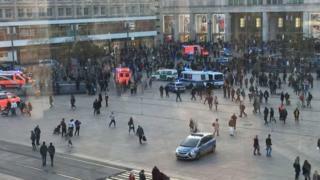 The fight broke out on Thursday evening on Alexanderplatz square in the German capital, police said, adding that nine people were arrested. More than 400 people had gathered after two social media influencers reportedly urged their fans to join a face-off. As tensions escalated, a large melee involving around 50 people erupted. Officers used pepper spray and tear gas after attempts to disperse the crowds with loudspeakers failed. As police intervened, clashes spilled over in a nearby subway, where rocks picked up from railway lines were reportedly thrown. Two officers were injured and six people were treated for eye irritation, Berlin Morgenpost reports. The brawl was the result of a “dispute” between two rival YouTube stars from Berlin and Stuttgart, according to local media reports. The YouTubers, named as “Thatsbekir” and “Bahar Al Amood” by German media, both denied they were at fault for the brawl in social media posts. Norbert Cioma, head of Berlin’s Gewerkschaft der Polizei (GDP) police union, called on social media celebrities with vast followings to be more responsible. “We see in the rapper scene, and increasingly also with other influencers, that they are sometimes very negligent with their influence,” he said.